Original TF-1000 was one of the best basketballs ever designed and produced. Over the last couple of years, Spalding released a couple of different versions of this ball hoping to enjoy the previous success. 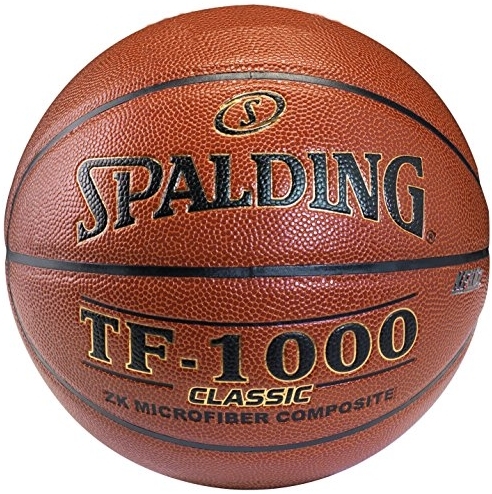 Although this model is slightly inferior to the original, it is inferior none the less and it makes you wonder why Spalding bothered in messing with the original formula. Well, the problem is that the original TF-1000 tends to wore out rather quickly despite being used on hardwood indoor floors. So, in response to that and in the hopes of being able to sell this model in bulk, Spalding tried to increase the longevity of the ball. We had it tested and found that there were some pretty weird compromises made in order to achieve the goal. This model is covered by ZK microfiber composite which is designed to give off a soft touch and increase the grip. But the ball had a strange feel to it straight out of the box. It isn’t as good as it was on the original, but after a period of breaking in, it was easy to get used to. Although many people complained that Spalding should have never changed the original formula, we feel that if these changes really result in an increased ball lifetime, it is a small price to pay. Once you get used to it, it really lies nicely in the hand and the wide channels provide enough control for constant release rotation. The wet hand also pointed out the compromises made when it comes to the grip/longevity, but the results were still on a level required for semi-professional usage. This is an official size and weight basketball and we really didn’t expect any hiccups in the bounce department. All the tests showed expected results but there was something that might not have any bearing in this case, but still, it was really noticeable. The sound of the bounce is quite different and the ball sounds kinda hard. This has no influence on the bounce consistency but it we really found that curious. We tried messing with the inflation rate, but this model still produced consistent results and basically was identical to the original. Although heavily criticized at times, Spalding did manage to make a ball that costs less, lasts longer, and still has the qualities that made original TF-1000 one of the best basketballs ever made. Considering that you can get this one for a good price on Amazon, we would say this is a model that really justifies the brand and the name it carries.